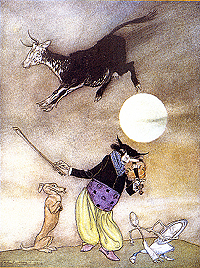 Carl Orff's opera Der Mond (based on a Grimm fairy tale) tells the story of four men who find the moon hanging on a tree. Each carries one quarter of the moon to the underworld when he dies, and the underworld becomes illuminated. The dead wake and begin a round of drinking and carousing that ends only when the Skykeeper rescues the moon and brings it back above ground, hanging it in the sky where it has remained ever since. "I Got the Sun in the Morning and the Moon at Night"
If you use one of the previous suggestions — or are developing a music event of your own — contact MOONFEST. We'll consider posting your event as an official MOONFEST Event on this web site. The moon's phases play a major role in myth, native rite and beliefs about human behavior, spanning all continents and cultures. The Dobu Islanders of the Western Pacific whoop and chant on the occasion of the new moon, believing that it brings happiness. In Sicily, the full moon was believed to be a powerful force for prosperity. Men and women were advised to hold a dollar up to the full moon's beams while saying, "Fill," nine times. In Cuba until 1928 the law prohibited cutting trees when the moon was in a period of increase. It was believed that the sap rose in the trees as the moon got bigger, thus good lumber could be cut only as the moon got smaller. In ancient Sparta, soldiers wouldn't go into battle until the new moon appeared.